Classe Danse In the early 1870s the female ballet dancer became Degas ' favorite theme. 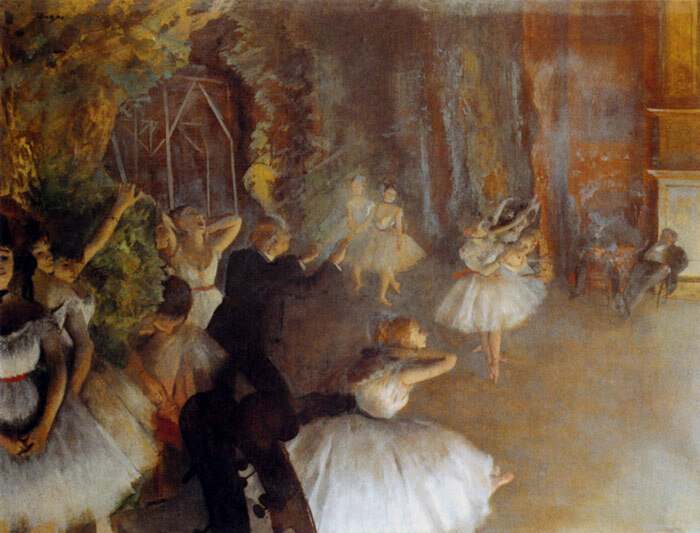 Degas sketched from a live model in his studio and combined poses into groupings that depicted rehearsal and performance scenes in which dancers on stage, entering the stage, and resting or waiting to perform are shown simultaneously and in counterpoint, often from an oblique angle of vision -''The Rehearsal Of The Ballet Onstage''. SPECIAL NOTE : The painter will make the reproduction as close to the original oil painting as possible. If you want your painting to alter from this likeness, please email us and " The Rehearsal Of The Ballet Onstage, 1874 " will be reproduced according to your special requirements.